You have probably seen this sticker or some variant of it--though you may not have properly noticed it or read what it said--on a vending machine in Japan. It is almost ubiquitous these days. It tells you that the vending machine will accept new 500 yen coins, but not old ones. That's because old 500 coins were susceptible to easy counterfeiting, especially in vending machines. 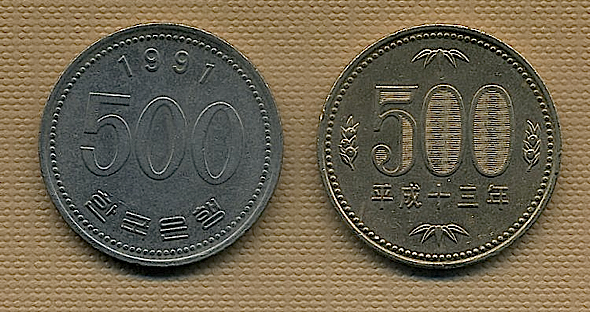 Today, as a follow-up to Dom's wonderful guide to Japanese coins, let's learn a bit about the history of counterfeit 500 yen coins in Japan. With minor changes most easily seen from an angle, the new 500 yen coins can be distinguished from their older counterparts by the filled in zeroes and serrated edges, old coins having smooth spaces inside the zeroes and smooth edges. As Dom noted in his article, there are also letters spelling out "NIPPON" written in tiny font inside the digits, though it takes time to pick them out with the naked eye. 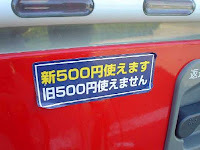 This "new" 500 yen coin came out in late 2000, having been hastily issued by the Japan Mint in response to a social problem that erupted in the late 90's. So what was this social problem? Well, it turns out that the old Japanese coin, by complete chance, was exactly the same size and composed of exactly the same alloy as the Korean 500 won coin. Though the two coins aren't so hard for a person to tell apart, to a machine the only discernable difference between these coins was a slight variation in weight. This side looks similar, but the pictures on the reverse are very different. Of course, the other major difference between these coins is their value. The 500 won coin was at the time worth only about a tenth of the 500 yen coin. That left a sizable 450 yen difference between the two. You are provide the very interesting information by this blog.I'm impressed by this information.Thanks for giveaway. You am provided me vending machine sale for link. I am fortunate for have. No is ham. what element does this coin have?.. is it silver or what?..please email me the answer here dark_dude07@yahoo.com...because i had found one..i'd like to know its content and value...PLEASE email me the answer..
Nickel-copper alloy. Cu75%-Ni25% I'd ask which coin you meant, but it's the same for both the 500 won coin (current, I believe) and the old 500 yen coin. I don't know a lot about alloy values, but I would expect it is not particularly valuable. 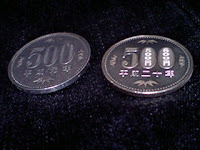 The 500 yen currency has only been issued since the early 80s, so the coin would not be particularly old, either. The "old" 500 yen coin you show is actually a new one minted to correct the problem.